PacMan is back in this 3D version of the classic game which provides you with several different themed worlds like the classic levels you were used to in the 80s to a whole new list of different environments your PacMan can play around in. One such themed level is the Donkey Kong Country level along with some pretty fun bonus levels. 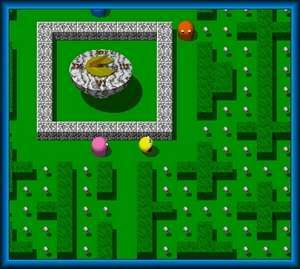 With 3D PacMan, you're able to choose from 5 different characters such as the original PacMan, Miss PacMan and several more in the freeware recreation. This iteration includes over 60 different worlds to play around in and avoid those pesky ghosts. For security reasons, you should also check out the 3D PacMan (Chompster) download at LO4D.com which includes virus and malware tests. Additional screenshots of this application download may be available, too. Chompster 3D - PacMan Returns Again! has a presence on social networks.